The school will be participating in the 2019 Safer Internet Day Events. This will be spread over 2 days from Tuesday 5th to Wednesday 6th February. Pupils will be engaging in lessons around e-safety, protecting yourself on-line and cyber bullying. We will also be contacting families with information and a survey to be completed by parents/carers. We are pleased to welcome Amanda to the staff team. Amanda joins us as a Therapeutic Tutor. We are pleased to welcome Chris to the staff team. Chris joins us as a Therapeutic Tutor. We are pleased to welcome Tiffany to the staff team. Tiffany joins us as a Therapeutic Tutor. The Yellow House have their first ever football team and have recently taken part in the SEN School Soccability Tournament. A great day was had by all the staff and pupils involved. Our pupils put on a fantastic performance representing the school and behaved impeccably. 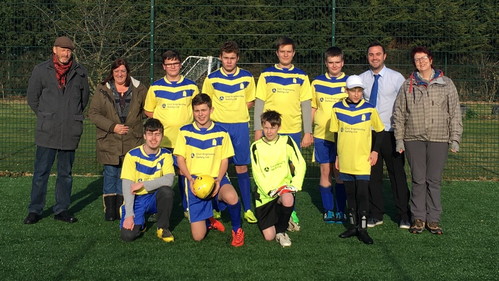 Our pupils looked professional in their new football kits and equipment which was very kindly sponsored by Civil Engineering Safety Limited. We are delighted to announce that David Ollier has joined The Yellow House team in the role of Head Teacher.